Its slightly edited so planner got points to encourage people to plan. Over the series we had over 250 runners. This was probably due to the beautiful weather that has greeted us every Tuesday evening. Congratulations to the winners, commiserations to those who didn't preform as well as they would have liked and a big thumbs up to everyone in between. Next week is the best* event in the year - our Score Event (short and adventure courses also avaiable) in Hollywood followed by a BBQ! For those that don't know, a score event is one where you have a set amount of time, usually 50mins to collect as many controls as you can. Different controls are worth a varying amount of points. The winner is the person who collects the most amount of points in the 50mins - if your over, your points get deducted per minute late. Time keeping, knowing your own abilities and planning are essential skills to excel at this format. 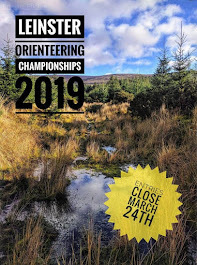 This event would be a perfect warm up for Setanta Wicklow Rogaine or an Adventure race with an element of orienteering invloved! From what I hear some of the forest has gone through some clearing so we now have access to new sections of forest. Don and Ruairi have planned so don't run off at the start like a headless chicken! A very successful event was held on the curragh this evening in beautiful weather conditions. We have one more event in the series to be held in Hollywood next Tuesday, this event will be followed by a BBQ. Thanks to our friends in the IOA we have made minor adjustments to our page. When CNOC results are loaded up onto the IOA website they will automatically upload onto our site. Well done to everyone who ran on Scarr last Tuesday we had Nine runners (yes Nine) in the event and two in the top five. The next run will be on Sorrell Hill on Tuesday next. Best of luck to everyone going to the 3 Day in Donegal, dont forget reports and photos for the site. CNOC's third event was held in Hillwood last night with the planner, controller and controller putter outs consisting of Ollie, Orla and Billy. By my calculations there was a grand total of 119 people out but giving the number of families that were running on the one SI card it was probably more. Without the usual scout troop and military buses coming from the Curragh this event still had a bigger turn out than last year (only 95 runners took part last year). Some of the forest was nice and runnable, some a bit scrappy, some with a few falling trees (tree down, 3 events done :) ), some sections covered in Blue bells! People made short work of the physical forest with some impressive times been posted. Reports from the forest were that Gerard Butler set a fast first time until the CNOC juniors/seniors? (perhaps immature is the best word) took off. Seamus went out one minute in front with the pack consisting of Conor Short, Niall Ewen, Ruairi Short and Colm Hill going out "le Mans" style. What I do know for definite is that Conor was first to the first control and after that its the usual stories from the forest. I'm sure one of them will have something up on a blog at some stage. CNOC's top runner on the Medium was David Cullinane in 4th place. Finishing less than 9mins down on the course winner David Healy. Dan Morrogh and Meave O'Grady made up the rest of the top 3. Top junior was Caoimhe O'Boyle finishing 12th over all. On the short course, Sean Kearns took the honors but was closely followed by brother Donal (both FIN). Top CNOC runners were the Kelly Family - finishing up 12th. If anyone has any photos please email them onto me - or race reports! Next up for CNOC is the Irish 3 Day in Donegal. I know the numbers won't be as high this year with injuries, Leaving Certs, Junior Certs, College work, Work and a few other suspect reasons for people not travelling the distance (imra, rock climbing tut tut tut). Good luck to all members who make the travel north and good look to the rest of them in exams. The end of June is Jukola (7 person Relay starts at 23:00)- its always a good nights entertainment. Did someone say CNOC team? CNOC's next event is on the Curragh on June 15th. Seamus O'Boyle is planner so it should be tricky. I'll have more info on this was we get closer to the time.